This photo was taken on January 9, 2018 at 9:45 AM. The location was in an intersection of busy streets in the Georgetown section of Washington DC. The "Take It!" 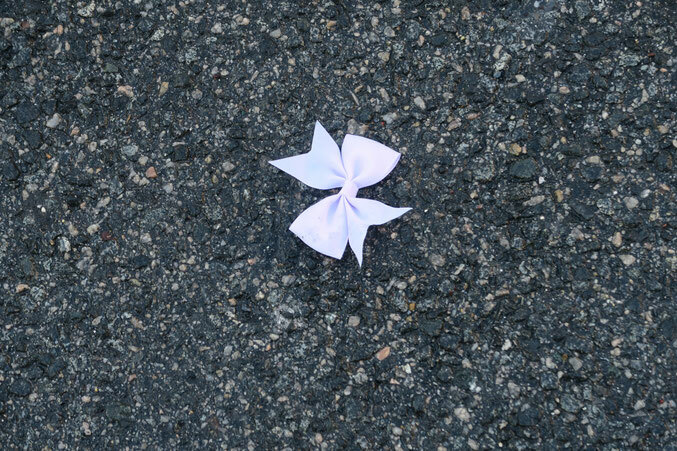 came from the near shock of seeing this near perfect bow in the middle of a cross walk at a busy downtown intersection. Maybe it was how fresh to bow looked - as if it had just been dropped and had not suffered being run over by a bunch of cars whose drivers could not see it in time to avoid it. The perfection of the edges of the bow contrasted with the stones in the off setting asphalt also served to draw in my attention. The After Take: To the few I showed this to I had to explain that it was more the contrast of colors and surfaces than anything else that caught my eye and called for the photo. That seemed to satisfy the question, but just barely - lol. I must say, the photo was taken very much on the fly as the pedestrian signal red hand had gone up, warning all to get out of the street. I suppose this could also be spoken of as lost innocence, given the setting and the time of day I happened upon it. Our daughter says it looks white to her. Our kid is running around going "that's not pink, that's not pink." She gets so hung up on the images, too young to read the rest so I guess looking is all she's got. Really stands out against the black of the ground. Hey everyone! Good to see the photos still coming out. The bow really does look freshly dropped. What races through my head when I see this is, where was it before it was an asphalt ornament, what led it to that spot.